NOW with Certified Organically Grown and fairly traded Shea Butter from Ghana. $30 1000ml bulk in a glass jar. Made fresh to order. Shea butter's long lasting healing effects have been appreciated by those with dry skin, cracked skin, and those who want a natural, moisturizing sunscreen without harmful ingredients like parabens. A little goes a long way! 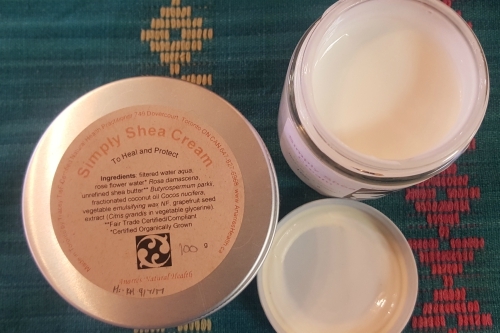 Naturally nourishing, moisturizing and sunscreening (@SPF 15), this fairly traded shea butter cream is safe for babies, and heals dry, damaged skin and hair. Rose true hydrosolsoothes and balances skin. Unlike commercial "shea" butters that contain <5% real shea butter in a petroleum base, this shea cream is 17%+ natural unrefined shea butter in a simple all vegetable base. The intriguing nutty scent is from the shea - and nothing else! Ingredients: filtered water aqua, rose hydrosol* Rosa damascena, unrefined shea butter** Butyrospermum parkii, fractionated coconut oil Cocos nucifera, vegetable wax (emulsifying wax NF), grapefruit seed extract (Citrus grandis in vegetable glycerine). Just wanted to let u know what it's like to have a big jar of ur Shea cream after running out of it...almost, there was about 1/4 teaspoon left in my little stone jar that I was stretching as far as humanly possible. So now, that I have a big jar I'm very happy, but that doesn't express the feeling. I've been grappling, trying to find the words to express the feeling. Suffice to say every cell in my body breathes a little sigh of gratitude when I put it on my hands. It's not just hand cream is tenderness in a jar. Thank you! Oh and btw the blister balm is working perfectly on the contact dermatitis (sp? ).Thank you again! 100g size comes in food grade glass jars with metal caps or metal canisters. We'll post in the aluminum canisters unless you specify otherwise. 200g size comes in metal canisters only. Wholesale and out-of-town orders for 1 litre come in mason jars. #1 trhea : Shaving Cream! I LOVE using this cream for shaving my legs. My legs always get insanely itchy after shaving, but not when I use this cream during, and after. Plus, I can use it all over my body and as a make-up remover. It's three products in one for me! I just wanted to send you a quick email letting you how amazing the Shea cream is. I had blemishes that would not heal for months and after using the cream only a few times the blemishes are gone! After a week everything has healed and that has never happened before. Ps the Rose water is really good too I use it 2 a day! #3 traceytf : Dry Cracked Skin Healed! Your shea cream ROCKS! It really cleared up my excema/dishpan hands. They were cracked and split, flaky and just gross and sore and itchy. They look normal now. I love the Shea butter lotion. I discovered it works better than soap to remove my makeup. It leaves my skin moist and clean. It also doesn't aggravate my rosacea.